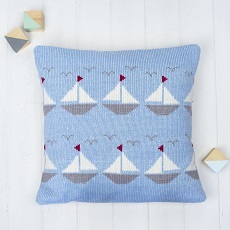 A handmade knitted children’s cushion featuring sailing boat motifs. Beautiful personalised cushion for babies and children featuring a sky blue knitted sailing boats motif on the front with optional personalised text in red. Carefully selected cream with red spots woven fabric on the reverse. This contemporary knitted cushion has been created using Smitten’s distinctive style; combining knitted and woven textures, to provide a range of tactile experiences for little hands to explore. Our knitted cushions for babies and children can be customised with a name, initials or date of birth (up to 7 characters) for a unique personalised baby gift. If you would like a personalised cushion please select ‘personalised’ from the drop down menu and enter your required text in the box. If you would like to purchase without personalisation, please select ‘non-personalised’ from the drop-down menu. Smitten cushions are approximately 40cm width x 40cm height. Perfectly sized to add comfort to the nursing chair, bed or for cuddling up on the sofa.